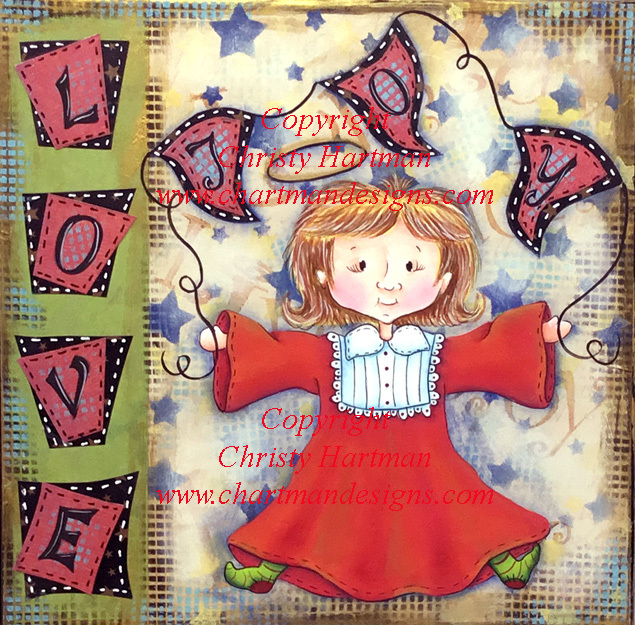 For some when you say mixed media they immediately are afraid because they imagine adding media elements that they do not have at home, mixed media simply is when you add two or more different media elements. I always add the painted instructions to my patterns when I have used scrap booking papers in my projects. Do not be afraid to use different paint colors and patterned papers to make this your own. This joyful angel can be kept out year round as I chose to not use holiday paint colors. I plan to display her with my Santa and Friends Mixed Media piece which can be found on my website. They will be adorable displayed together which was my plan when I designed this project. This e-pattern includes 8 color photos with detailed instructions for using patterned papers as well as painting the background. Full line art is also included. I've used stencils in the background to help develop depth and texture. She is painted on an 8"X 8" deep edge canvas but could easily be adapted to a variety of surfaces.